Create an experimental electronic artist book for Kindle. Using the Manga/Comic/Graphic Novel example provided as part of Kindle Format 8 Publishing Tools to create the electronic version of Gone Awry. Use KindleGen and Kindle Previewer to create the electronic edition and check quality. The linux version of calibre is used to check the generated .mobi file, and to tag and edit metadata. Then, upload the generated .mobi file to the Kindle Direct Publishing web-app, and fill in all rest of the metadata in a browser. From the web app, publishing it on Amazon is easy. Amazon’s current proprietary format is: Kindle Format 8, or KF8. The file extension is .mobi. The Amazon specifications are in: Amazon Kindle Publishing Guidelines. Parts of this also use OPF, the packaging for epub. Some key data points about display resolution of select current-model e-readers. Plan is to only support color, high-resolution devices. Versus layout for Gone Awry. First, resize existing .svg base documents in inkscape to the correct aspect ratio. For this project, the aspect ratio is 1.6. Thus, inkscape page sizes are changed from 19 x 13 inches to 19.2 x 12 inches. This file is then exported as a transparent bitmap, at 2560 x 1600 @ 300dpi. Re-write example to suit Gone Awry, based on prototyping with a DocBook 5.0 XML form to generate the beginning HTML. Take this, edit the .opf and .ncx files to create a manifest and a table of contents/touch list, and bundle it up with the toplevel “images” directory such that the resulting filenames in the generated “gone-awry.opf” file are correct. From this, one can make back-of-the-envelope calculations about the royalty rates. For 70% royalties, the publisher must pay Amazon $0.15 per 1MB of .mobi file delivered. Thus, for a 40MB file, the delivery charge would be $6. So, the price would have to be more than this to break even. For 30% royalties, there is no delivery fee so pricing could feasibly drop below $6. The final book looks like “Gone Awry Kindle Edition” on Amazon’s marketplace. Future work would be to shift to SVG containers, improving text legibility by un-rasterizing the text or presenting a vector text layer, and look at ways to add “scroll anchors” such that a “page flick” motion would speed through the next couple of pages before alighting on the specified anchor. Some notes from 2011 on self-publishing. Current best sellers in the Kindle Store. August graphic novel sales, information, reviews. Some of the meta-problems with pagination, and mapping electronic books to print books. Some meta-hating on some aspects of the current state-of-the-art. Two horizontal pieces, each with accompanying vertical ensigns. Large format screenprints on Japanese paper. Each piece contains at least one unique mark indicating an anniversary year. There are one, two, ten, fifty, or hundred year anniversary year marks to choose from. Some of the pieces contain multiple marks: a joint hundred-and-fifty year anniversary. A combined ten-, fifty-, and hundred-year anniversary. A massed cloud of ten-year anniversaries. A broken grid of two year marks. In theory, this is similar to the numerology behind the Japanese festival Shichi-Go-San (7-5-3), but for older people and spanning much wider spans of years, including multiple generations. So, one version is 100-10-2. Another version is 100-50-10. The hundred-year anniversary of John Cage’s birth. The fifty-year anniversary of the favorite dojo opening. A ten-year wedding anniversary. Two-year anniversary of Tohoku tsunami, the two-year anniversary of the Syrian uprising. A child’s first birthday. 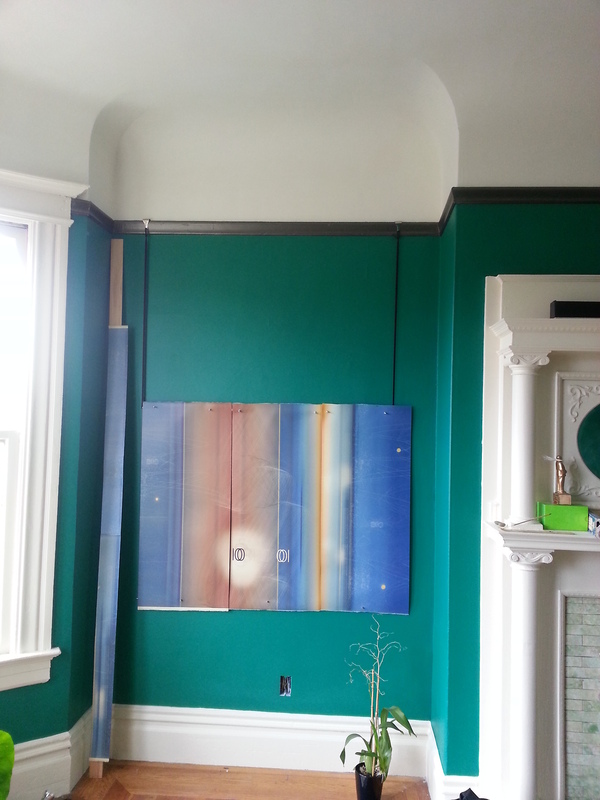 Two narrow diptychs, flanking. 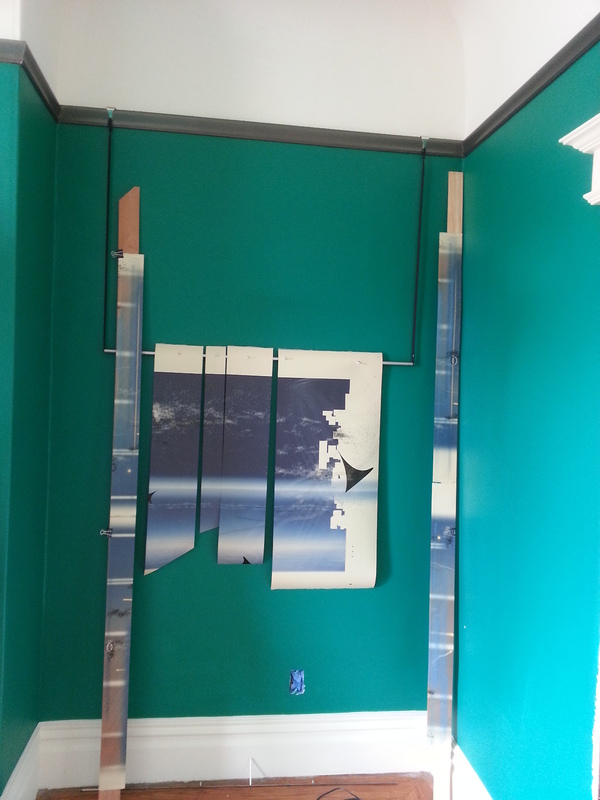 Two strips of paper, joined in the middle to form one narrow vertical band and hung where two walls meet. If desired, both planes that meet at the corner can each have a slightly different ensign at the meeting point. Size is 90mm x 965.2mm for each strip, so a total surface area of 90mm x 1930.4mm. Hand-fed inkjet on re-sized surface gampi. Wide diptych. Four irregularly-sized sheets of paper, joined in the middle to form one wide horizontal band with visible cuts. Size is 431.8mm x 965.2mm for each sheet, so a total surface area of 863.6mm x 970mm. Hand-fed inkjet on re-sized surface gampi. Narrow diptych. Two strips of paper, joined in the middle to form one narrow vertical band and hung where two walls meet. If desired, both planes that meet at the corner can each have a slightly different ensign at the meeting point. Size is 90mm x 965.2mm for each strip, so a total surface area of 90mm x 1930.4mm. Hand-fed inkjet on re-sized surface gampi. Wide triptych. Three long sheets of paper, one with a section cut out, joined at the edges to form one wide horizontal band. Size is 431.8mm x 965.2mm for each sheet, so a total surface area of 1295.4mm x 970mm. Hand-fed inkjet on re-sized surface gampi. Gallery West, Ginza 1-3-3, Chuo-ku,Tokyo, Japan. Paper is from Kochi, Japan. “KM-04 Surface Gampi Natural” sourced via Hiromi Paper International in Santa Monica, CA. Printed at Devastation Pacific, Capp Street, San Francisco, CA. Japanese language version of this page: 周年のプロジェクト.